How to Eat Your Sunscreen!? Yes, you heard me right! Learn how to eat your sunscreen! 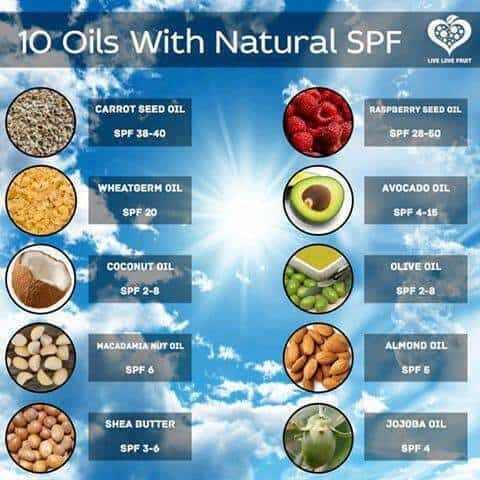 It might sound crazy, and I’m certainly not encouraging you to eat sunscreen out of the tube, but did you know that many foods contain a natural SPF that can up your resistance to the sun from the inside out? A large factor that goes into natural sun protection is the foods we eat, specifically foods that are highly anti-inflammatory and highly antioxidant. In the western world, dermatologists often prescribe chemical-based sunscreens for sunburn prevention, but that’s just a “band-aid” approach to the underlying cause of topical sun damage… inflammation. What you want is a way to up your skin’s sun resistance through diet in conjunction with a good mineral sunscreen to help ward off the sun’s harmful rays. You may have wondered while watching documentaries or while traveling, why indigenous cultures never seem to have sunburn. The fact of the matter is… they just don’t! A lot of this has to do with climate, culture, location, and of course, diet. Namely a diet composed of REAL FOODS. These cultures aren’t exposed to the toxic yet alluring foods we’ve become accustomed to. They eat real, straight from the earth, raised on the land food allowing them the luxury of practically non-existent skin cancer. They also happen to have naturally darker skin. People close to the equator developed darker complexions because melanin (the pigment in our skin) is a natural defense against UV rays by blocking them from damaging skin cells. How can Lighter Complexioned People do the Same? Get a tan little by little, usually a few minutes per day at first and then gradually increase it. Remember not to use conventional sunscreen during this exposure or you won’t tan at all. The key here is to naturally up your vitamin D levels. This will then encourage melanin production that helps shield the skin from UV exposure. Of course, this isn’t the beeeest way to do things if you’re not careful. The key is gradual sun exposure so you slowly build up your skin’s tolerance to the sun in the safest way possible. For those of us with lighter skin, really the very best thing you can do is eat an anti-oxidant rich diet with tons of anti-inflammatory foods while using a good natural sunscreen. A tan does help though, but only to an extent. You will still need sunscreen! Why do we get Sunburned? Sunburn is a type of inflammation. If our diet contains little amounts of anti-inflammatory foods, it’s easier for us to get burned. Diet has a tremendous impact on the body when it comes to inflammation. Upping your intake of anti-inflammatory foods will not only boost your resistance to UV rays but will also improve overall health. There are many conditions that can be healed and improved by “eating your sunscreen”. • Packaged/processed foods like chips, soda, sugary treats, frozen dinners, etc. • Polyunsaturated oils like soybean, cottonseed, corn, and peanut oils. Fast food places use these! Welllll….yes and no. A lot of sunscreens are quite toxic and definitely cause more harm than good. The only sunscreen I have ever recommended to others is this one. According to The Environment Working Group, it’s by far the cleanest and purest sunscreen on the market. It’s also very effective. I personally hate the feeling of any sunscreen on my body and prefer to cover up instead with flowy layers and large hats. Plus it gives me an excuse to use a parasol! But if you need to use sunscreen, then by all means, find one that is high-quality and mineral based for best results and avoid the ones with nano-particles. So there you have it! Do you eat your sunscreen?